You don’t need flour to make cookies. You don’t even need an oven. You don’t need a kitchen, real utensils, or, in my case, a man. That’ll show ’em. Kitchen timer, if your toaster oven doesn’t have a timer. Spatula for taking the cookies off of the toaster oven pan. Turn the thermostat on your toaster oven to about 375 or 400–always add twenty-five to fifty degrees for any toaster oven recipe. Line the toaster oven pan with tinfoil. Measure the sugar into a bowl, and crack the egg into the sugar. Spoon out the peanutbutter, and mix the whole mess with the tablespoon. Put tablespoon-sized pieces of the batter onto the tinfoil-lined toaster oven pan. Turn your kitchen timer or toaster oven timer to run for eight minutes. When the timer goes off, take the pan out of the toaster oven, and let cool for about ten minutes. These are fragile, like my ego–let them cool before removing them from the pan. Repeat until the batter is used up. These are very, very rich. Eat slowly, savoring your very clever independence. Cost: Whatever 1/4 of a Costco peanutbutter tub costs and about 75 cents in power. I love everything about this recipe — could that be because we’re related? I can’t wait to try it. Your opening paragraph made me laugh out loud. 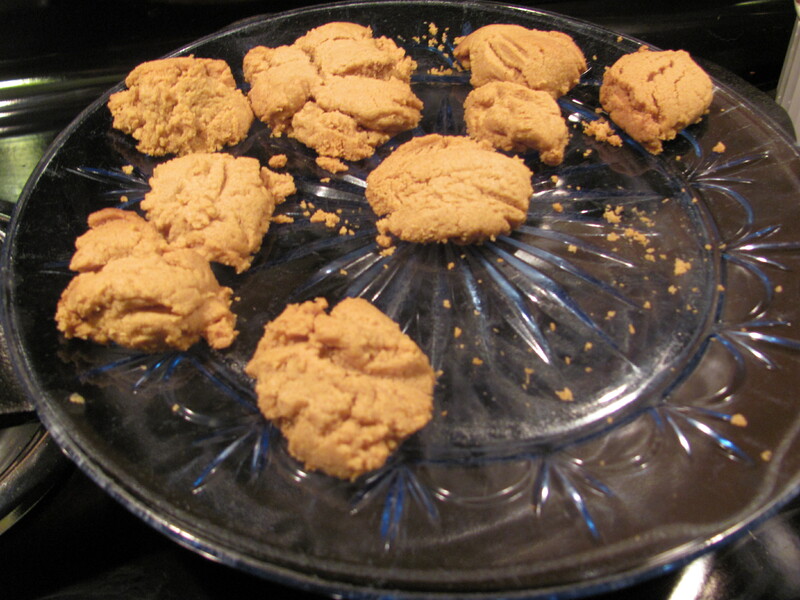 The tablespoons of peanutbutter were to avoid dirtying another cup.